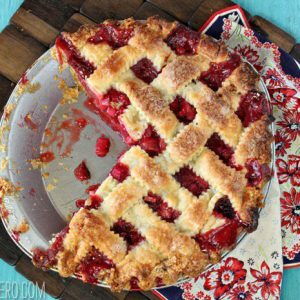 This strawberry rhubarb pie is a summertime classic! A flaky, buttery crust is filled with the perfect combination of sweet, juicy strawberries and tart rhubarb. Top it with a scoop of vanilla ice cream or a dollop of whipped cream! Note that I use Ultra Gel in this recipe, which is a thickener often used in jams and pie fillings. I like it because it doesn't leave a starchy taste like corn starch and flour sometimes do. I can find it at my local grocery store near the canning supplies, but if you don't have it, no worries! The Note at the bottom of the recipe provides some Ultra Gel substitutes. To make the crust, combine the flour, sugar, and salt in the bowl of a large food processor (10 cups or larger size) and pulse a few times to combine. Add the cold cubed butter and shortening, and pulse in short bursts until it’s cut into the dry ingredients and the mixture has the texture of coarse crumbs. Add half of the ice water and pulse in 5-second bursts, adding the rest a little more at a time just until the dough starts to come together. You may not need to use all of the water—stop when the dough starts to come together, and don’t overwork it! Turn the dough out onto a lightly floured board and knead it just enough to incorporate any dry patches of flour. Divide it in half, shape it into two discs, wrap them well in plastic wrap, and refrigerate them for an hour to chill. The crust dough can be made several days in advance and kept in the refrigerator until ready to use. Preheat the oven to 400 F. Combine the sliced rhubarb, quartered strawberries, both sugars, Ultra Gel, vanilla extract, and salt. Toss them together, then let the mixture sit and let the berries release their juices for about 25 minutes. Drain away the liquid that has accumulated. Flour your work surface and rolling pin, and roll half of the dough out. Transfer it to your 9” pie pan and trim any overhang from the sides. Scoop the filling into the pan, leaving any extra liquid in the bowl. Roll the second half of the dough out until it is about 1/4-inch thick. Cut it into 1-inch strips with a pizza wheel or pastry cutter. Lay the strips on top of the filling, evenly spaced, with a 1/2-inch space between each. Lay another set of strips across the first, running in the opposite direction. (If you want to weave your lattice crust, use the video as a guide.) Crimp the edges of the crust together. Brush the top with the lightly beaten egg, then sprinkle granulated sugar over the top of the crust. Place the pie on a baking sheet covered with foil—the filling will bubble out of the crust, so spare yourself some scrubbing and make sure your surface is well-covered! Bake the pie for 20 minutes at 400 F. Reduce the oven temperature to 350 F and continue to bake. Cover the top of the pie loosely after 30-40 minutes total, once it starts to take on a dark brown color. Bake for about 60 minutes at 350 F (so 1 hr 20 minutes total baking time), and remove the foil for the last 10 minutes of baking. The pie is done when the crust is crackling and dark brown, and the filling is bubbling thickly from the pie. Let the pie cool until it is warm but not hot, then serve with ice cream or whipped cream. It can also be enjoyed at room temperature or cold, and the filling will have a thicker texture if you chill it before cutting. The crust recipe requires a large food processor, with a minimum 10 cup capacity. If you have a smaller processor, it’s best to make the crust in 2 batches, or use prepared pie dough instead. If you can't find Ultra Gel, you can substitute 1/3 cup of corn starch or flour instead. The recipe for the pie filling adapted from Bon Appetit’s Strawberry-Rhubarb Pie.